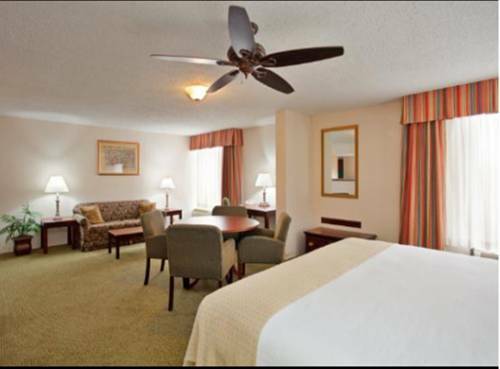 Other Huntsville Hotels Can't Beat Our Holiday Inn Hotel Our Huntsville hotel is located just 14 miles from the Huntsville International Airport, as well as convenient to numerous businesses and attractions. For business travelers, we offer a well-equipped Business Center and eight on-site meeting rooms that total 5,420 square feet of meeting space. Our Huntsville hotel's location also places our guests near numerous corporate businesses, including Cummings Research Park and Redstone Arsenal. We are just a few miles from the Von Braun Civic Center and the John Hunt Park, as well. Families in Huntsville can easily visit the Early Works Children's Museum or the US Space Camp as they are both close to our hotel. Be sure to explore the Huntsville Botanical Garden or visit the US Space and Rocket Center, too. If you need to relax, the Robert Trent Jones Golf Trail is only 15 miles from our hotel. We are confident that our guests will love the free high-speed fiber optic wireless Internet access that we offer throughout the hotel. After a long day of work or sightseeing, you can relax in the indoor or the outdoor pool. Our hotel's restaurant, Hopper's Bar and Grill, offers delicious American cuisine and your favorite beverages..
Rosie's Mexican Cantina: Home to delicious margaritas and even better mexican cuisine. Rosie's is ranked 4th out of 484 restuarants in Huntsville, according to Tripadvisor.com. They offer mahi mahi fish tacos and a grilled salmon salad along with fried ice cream for desert. Hopper's Bar and Grill: If you're looking for a great place to enjoy drinks with friends or coworkers, then look no further than our Huntsville, Alabama hotel's Hopper's Bar and Grill. After a long day of business or sightseeing, unwind while enjoying your favorite drink. Childrens's program - KIDS EAT FREE, Complimentary gift upon request at Check-in. Indoor / Outdoor Swimming Pool. Grand Ballroom: 3,920 square foot unobstructed meeting and banquet facility. US Space and Rocket Center, U.S. Space CampFrom incredible displays of artifacts from our nation's space program, to hands-on interactive exhibits and space travel simulators, the U.S. Space and Rocket Center experience is unlike any other. Redstone ArsenalHome to NASA and Marshall Space Flight Center as well as many other Commands.